When we visit a new city, we go to the stationery shops, bookstores, cafes, and art supply stores. We find things we couldn’t get back home—that navy blue pen from a shop in Paris or a letterpress card from a studio in Kansas City. Those moments of discovery are one of the best reasons to travel, but every great city has places that offer inspiration and the thrill of something new to its own residents. We opened St. Louis Art Supply with the aim of becoming one of those places, and we’re changing it every day to keep you guessing. Our products come from small workshops and high-tech factories in Japan, Germany, France, the Netherlands, England, and the U.S., in boxes of 200 and in limited editions. Nothing on our shelves is accidental; we look for bold design, craftsmanship, durability, and, above all, functionality. Our bright, modern shop in the Central West End is filled with everything you need for painting, drawing, reading, and writing. 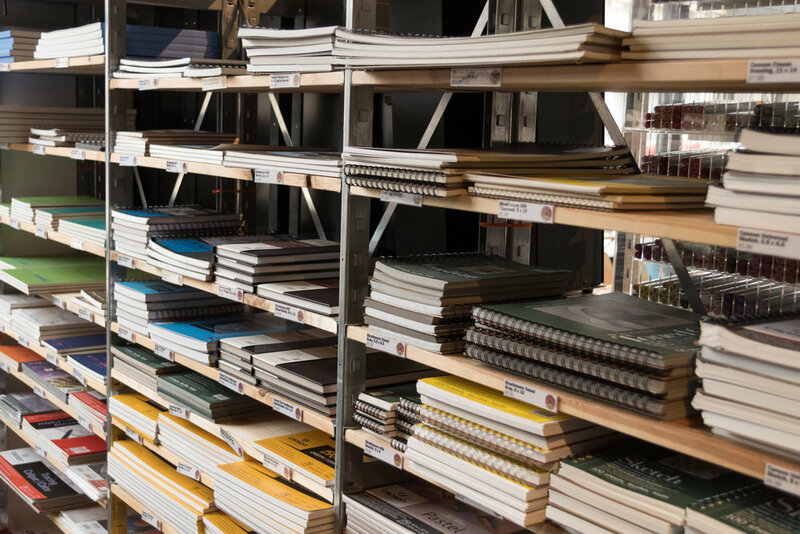 Our selection of notebooks and writing paper is the best in town, with brands, sizes, and formats you won’t find elsewhere. Unlike most traditional art supply stores, we carry a wide range of fine writing pencils and fountain pens. 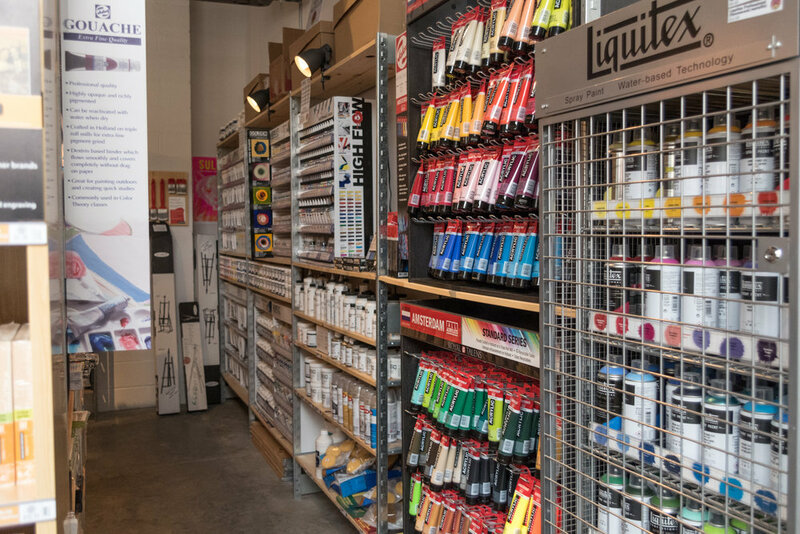 Our painting department has recently expanded to include hundreds of brushes, several high-quality lines of watercolor, oil, and acrylic paints, and a wide variety of artist canvas and wood panels. In our bookshop, you’ll find much more than art books—we also carry a curated selection of poetry, philosophy, politics, and literary fiction. And once you’re done exploring all that, we invite you to try a cup of locally roasted coffee and a scratch-baked muffin at Cornflower, our in-store cafe. The simplest way to sum up our product offerings is to list our four key disciplines: painting, drawing, reading, and writing. We are comprehensive suppliers for painting, drawing, and writing, and we offer a unique selection of books to fuel the fire. Art paper. (Pictured above.) We offer pads, sheets, rolls, and boards for pencil, pen, marker, pastel, and paint. We have an extensive selection of Canson and Strathmore products, including the popular student-grade Canson XL line, Mi-Teintes pastel paper, and numerous Strathmore 300, 400, and 500-series pads. Our high-end paper selection includes Stonehenge (pads and sheets), Yupo synthetic watercolor pads, Lenox 100% cotton paper, Arches watercolor sheets, and numerous archival printmaking papers. Artists and designers are increasingly using mixed media paper as their primary surface, and we’ve responded by adding lots of options that can accept both wet and dry media. Bookbinding supplies. We sell awls, thread, colored cord, tape, archival glue, bone folders, and a number of other items for making books. Books. The right book can be an art supply, too. Our bookshop is designed to inspire, provoke, educate, and organize. Of course, we have lots of reference and instruction books to help you make art. You’ll also find a carefully selected, highly idiosyncratic assortment of literary fiction, poetry, philosophy, political theory, art criticism and art history. We can order most other books for you within a week. Brushes. We’ve got the right brush for any oil, watercolor, or acrylic painting project. Some of our brush lines include Princeton Snap and Select student-grade brushes, Princeton Catalyst and Aspen synthetic bristle brushes, Winsor & Newton kolinsky sable, Da Vinci Cosmotop synthetic sable, Princeton Neptune synthetic squirrel, and Princeton Refine artist-grade natural bristle brushes. Calligraphy supplies. If you’re into calligraphy or hand lettering, you’re in luck. Nobody in St. Louis comes close to our calligraphy department. We have 30+ dip pen options, including newly manufactured Brause nibs, imported from Germany, and vintage nibs (in new condition) as old as 1915 from defunct companies like Esterbrook. We have dozens of ink options, including Bombay india ink, Golden High Flow, Japanese sumi ink, and several liquid and solid metallic inks. In addition to traditional pen and ink, we offer calligraphic fountain pens from Pilot and LAMY and a dizzying array of Japanese brush pens from Kuretake and Pentel. Canvas and surfaces. We carry extremely high-quality studio-depth and gallery-depth canvases from Masterpiece in sizes up to 48” x 60”. We also offer value packs of canvas for practice, painting paper, and Ampersand wood panels. We can custom-build canvases to your specifications, up to 60” in width. Charcoal. Our charcoal options include wood-cased charcoal pencils, compressed sticks, and traditional vine sticks from Faber-Castell (Germany) and General Pencil (USA). Colored pencils. We have every color of Faber-Castell Polychromos colored pencils and Albrecht Dürer watercolor pencils, Derwent Coloursoft and Watercolour pencils, and Tombow Recycled Colored Pencils. Drawing pencils. We carry quite a few. Customer favorites include Tombow MONO, Faber-Castell 9000, and Staedtler Mars Lumograph. Fountain pens. We are authorized retailers of LAMY and Kaweco products. We’ve got LAMY Safari and AL-Star and Kaweco Sport pens in lots of sizes and colors, plus lots of other fountain pen options from $10 to $80. We’ve got pens made of plastic, aluminum, brass, stainless steel, and titanium. Our pen counter offers testing and service, including troubleshooting and nib replacement. We carry many parts and refills and we can order those we don’t have in stock. Gifts. But not the disposable kind. Our gifts are things you’d want for yourself, like a special five-year diary or a glossy book on architecture. We have high-quality art sets for kids and smart tins of artist-grade supplies for adults. We offer gift cards in any denomination. We wrap gifts precisely, tastefully, and for no extra charge. Markers and art pens. We carry Copic Sketch and Original markers, Tombow Dual Brush Pens, Sakura Micron and Copic Multiliner pens, Faber-Castell PITT fineliners and brush pens, Stabilo pens and markers, and a huge selection of fine-tipped brush pens. We have waterproof ink and water-soluble ink. We have every size and color. There’s literally a wall of pens and markers, plus more displays scattered throughout the store. If you loved back-to-school supply shopping as a kid, this is going to work for you. Notebooks and journals. You’ll find some of the world’s best and most sought-after notebooks in our shop. Our flagship notebook stock is Midori MD Paper, which we offer in a huge number of formats, bindings, and sizes. It’s a highly balanced Japanese paper that works beautifully with pencil, fountain pen, and everything in between, and Midori binds it so that it’s simple to use and carry. It’s also the paper used in Traveler’s Notebook, a modular system inside a hand-cut leather cover that can include calendars, sketchbooks, folders, sticky notes, and anything else you might need in a single book. We’re one of the only stores in the Midwest that’s authorized to carry Traveler’s Company products. Our other notebook brands include Field Notes (based in Chicago), Baron Fig (New York), Clairefontaine/Rhodia (France), and Maruman (Japan). Paint. This is the section where we always linger, peeking in tubes and jars and wondering how they make that color. We sell Holbein artist-grade oils and watercolors, Gamblin artist and student-grade oils, Golden Heavy Body, Fluid, and High Flow artist acrylics, Liquitex acrylic spray paint, Amsterdam student acrylics, Van Gogh watercolors, Talens gouache, and Cobra water-mixable oil paint. Printmaking supplies. We offer a good selection of printmaking items, including linocut blocks and tools, silkscreen supplies, etching tools and plates, and both acrylic and oil-based printing inks. Stationery. Our small but growing selection of stationery includes Midori and Strathmore cotton writing paper and envelopes, patterned writing paper with matching envelopes, cute animal-themed stationery sets, boxed cards, washi tape, stickers, and handy button-and-string envelopes. Studio essentials. We stock glue, tape, staple guns, rags, gesso brushes, tote boards, portfolios, and lots of other important miscellanea for the art studio or creative office. Writing pencils. We have the ever-popular Blackwing line of premium writing pencils, along with a surprising number of #2s from other manufacturers. Our personal favorite? The super-dark, super-smooth writing pencils made by Mitsubishi Pencil Co. (known here in the U.S. as Uniball) and sold on the Japanese market. Craft supplies. We like them but we just don’t have the space. Foam boards. We used to buy these, and they always arrived with crushed corners. They also take up a ton of space that we’d rather fill with more interesting stuff. Moleskine notebooks. They’re okay notebooks with a premium pricetag that are available everywhere else. Prismacolor Premier colored pencils. We dropped these pencils several years ago for a number of reasons. Their quality, once the industry standard, has gradually declined over the years as the company has been repeatedly bought and sold. For more information, see our note to customers. Sculpture and molding supplies. These are heavy and expensive to ship, and using them often requires equipment (like kilns and potting wheels) that we don’t have space for. When we carry something, we like to have everything you need, and we couldn’t do that with sculpture supplies. We recommend Krueger Pottery Supply for St. Louisans in need of these items. We’re located in the Central West End, near some of the best shopping, dining, and entertainment in St. Louis. Come browse our colorful, constantly changing inventory of art supply, writing, and stationery products, or flip through one of our hand-selected books. While you’re here, grab coffee and breakfast or lunch at Cornflower Coffee & Tea, our in-store café. Sign up for our email newsletter and we'll send you news about the retail store and coffee shop. If you have questions about our store or our products, please fill out the form on the right and we'll follow up with you within two business days. Looking for a quick answer? Give us a call during business hours at (314) 884-8345. You can also email questions and comments to hello@stlartsupply.com.